Mew Gull has a partial moult in spring. It starts in February and is completed by April, leaving birds in so-called "first summer" plumage. The head turns much whiter, with the white chin, throat and breast white and dark streaking confined on the crown, hind-neck. 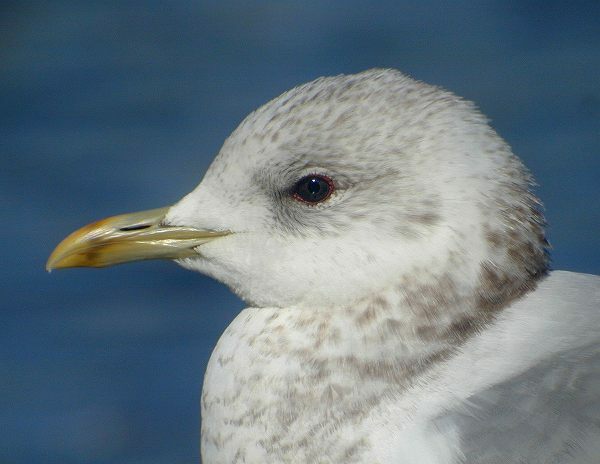 The tertials, wing-coverts, primaries and tail-feathers are excluded from this moult and turn paler, the grey parts turn almost white and very worn at the tips. The dark primaries and the lesser coverts start to bleach to pale brown. The second generation grey scapulars create a saddle. The legs are greyish. From June to October, a complete moult will bring birds in so-called "second winter" plumage. The head and hind-neck are strongly spotted and from the hind-neck, these spots form streaks, creating a collar running down the sides of the breast. Under-parts, tail-coverts and rump are white. The second generation primaries resemble adult primaries, but the black is more extensive in the outer-wing, with black sub-terminal markings down to P4 or even to P3. The greater and median primary coverts and the lesser coverts in the carpal edge are dark centred as well. The white tips on the outer primaries are ill-defined, wearing off quickly and the mirrors on P9 and P10 are smaller than in full adult plumage. The tail is all-white in race canus. The iris is brown, the greyish bill has a clear black bill-band. After the complete moult in June to October, brachyrhynchus may still show several immature feathers in the wing. The central tertials and some of the tail-feathers may show dark immature centres (even creating some kind of a tail-band in some individuals). Immature features can also be found in the central greater coverts and in the carpal edge and can even be found on the upper-tail and under-tail coverts. 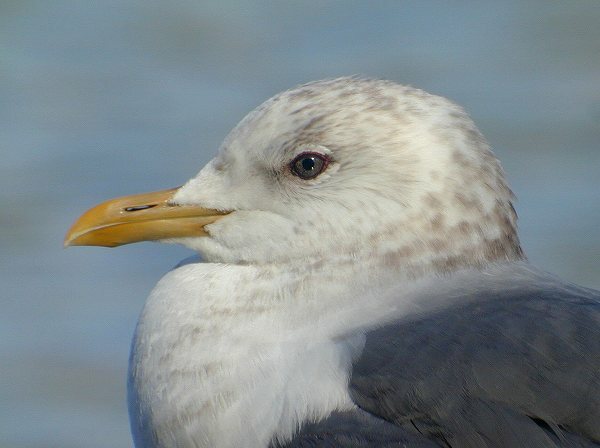 These immature features are less often found in nominate canus, which show no vestiges of a tail-band from autumn 2cy onwards ("second winter" plumage and later). 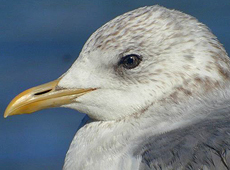 In this respect, brachyrhychus resembles Ring-billed Gull, L. delawarensis. From autumn 2cy onwards, the iris in brachyrhynchus may turn obvious pale. The race kamtschatschensis shows similar amount of patterning after the complete moult as brachyrhynchus, with many immature markings in tail, tertials and wing-coverts. Moreover, (all?) kamtschatschensis still shows black tips on the white under-wing coverts. from: Gulls of Europe, Asia and North America by: Klaus Malling Olsen & Hans Larsson. L. c. canus (NW Europe to Baltic and coast of Russia east to Moscow and Kola Peninsula. Winters N, W and S Europe). Wings on average shortest in S part of breeding range (see Measurements). L. c. heinei (Russia E of range of canus; from E of Moscow and between Kanin Peninsula and basin of Lena River; occurrence further E poorly established (Dement’ev & Gladkov 1969). Winters Baltic to Black Sea and NW Europe, rarer Persian Gulf to Pakistan; recorded on migration E Asia and rarely in winter in Korea and Hong Kong (G.J. Carey in litt)) Very similar to canus. lntergrades common in W Russia, including both wing/tarsus length and plumage characters, making field identification impossible in all but large birds. Combination of heinei measurements and canus plumage characters typical in Estonian breeders; many wintering birds from the Baltic have canus measurements combined with heinei plumage characters (Johansen 1961, Carey & Kennerley 1996, Bengtsson & Pedersen 1998, pers. obs., skins in UZM, ZMA). Ringing recoveries of Danish and Dutch winter birds from breeding areas of heinei (Russia, Kazakhstan (K. T. Pedersen in litt.) confirms occurrence in W Europe. Only birds showing a combination of heinei measurements and plumage characters are included in the summary below and measurement series. L. c. heinei often has a fuller head (and thus sometimes a smaller-looking bill) than canus. 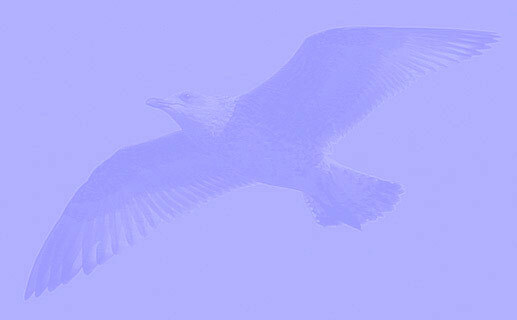 Has 'hanging hand' habit (as in Iceland Gull) as a result of longer wings. On folded wing, tertials cover three (four) inner primaries (four in canus). Compared to canus, wing-tip generally more pointed: P10 (0)4-10mm longer than P9 (0-7mm longer in canus). Bill generally heavier and more parallel-edged. In the hand, males can be separated on a humerus length of 98.5 or more, ulna length of 112 or more and radius length of 198.5 or more, with females 95.5, 107 and 104 respectively (Kompanje & Post 1993). Measurements in adult January section. 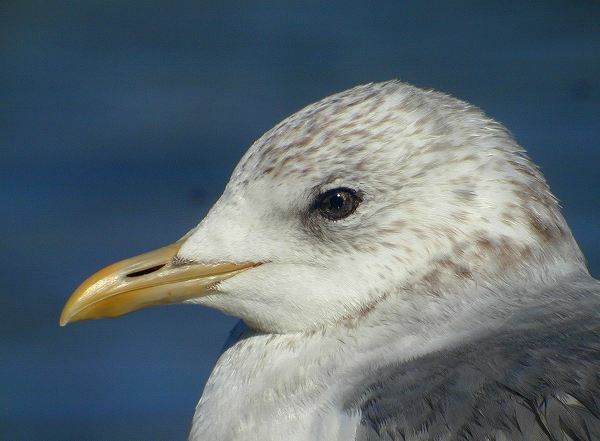 Head and underparts generally heavier marked in winter/first-years, sometimes forming complete dark-spotted necklace or large dark patch around eye (rare in canus). Rump and tail-base with heavy dark markings. First-winter similar to canus, but greater upperwing-coverts on average darker, deeper brownish-tinged, typically with weak dark subterminal spots; outer greater coverts gradually darker; sometimes similar to first-year Lesser Black-backed. Greater coverts may, however, be paler, offset by better wing contrast: lesser coverts generally darker brown than in canus, creating a stronger dark leading edge to the inner wing. Underwing similar to canus, but often paler with narrower, more distinct dark edges to coverts and axillaries; some with barred axillaries as in Eurasian Curlew Numenius arquata, others white (underwing then resembling first-year Ring-billed Gull). Dark tail-bar similar to canus (40-51mm on T1 ). May develop pale bill-tip from May, earlier than canus. Second-winter more often than canus has dark markings on lesser coverts, secondaries and tail (in about 10%; dark tail markings in 25% of Mew Gulls in Finland, winter (Peltomaki 2000) suggests heinei). Size, wing-tip pattern and more heavily marked head and body in winter plumage invites confusion with Ring-billed Gull, but as dark as or darker than canus (Ring-billed paler than canus). Moult generally later than in canus. 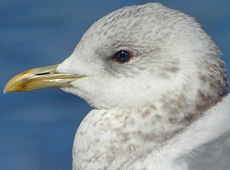 Most adults still show winter head in mid-Apr, when S Scandinavian breeders are white-headed (pers. obs,). P1-P2 late June. Moult to first-winter on average later (Aug-Nov); in late Sep no sign of moult to first-winter (Skjapin 1977, Tove 1993). Most Oct-Dec birds show <50% new mantle feathers (all or most of mantle normally renewed in southern canus; moult of N canus similar (Bengtsson & Pedersen 1998). Most Finnish winter birds (showing heinei characters) retain >50% juvenile mantle late Dec.
Primary moult probably slightly later than canus. 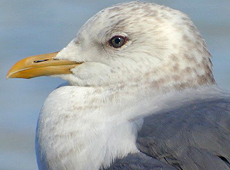 Mew Gull is a widespread species on the northern hemisphere with several sub-species: in N America brachyrhynchus, in W Europe nominate canus, in W Asia and Russia heinei and in the Far East sub-species kamtschatschensis. The American race brachyrhynchus is a breeding bird of Alaska, the American West coast and inland Canada. After the breeding season, it disperses south along the coast to California. Brachyrhynchus can be readily told from nominate canus, and therefore sometimes considered a full species: Mew Gull. The differences can be found in the bill (in some birds obviously small), but most in plumage. Nominate canus is a common breeding bird in North Europe, wintering both in the breeding area and slightly south, to the northern coast of the Mediterranean. The race heinei breeds from White Russia eastwards to central Mongolia, in a broad band over the tundra region of inland U.S.S.R. It can be found wintering in the central Asian states, southern Black Sea and Caspian Sea and further south to the Persian Gulf. Part of the eastern population of heinei may follow a more eastern route to the coast of China. Race kamtschatschensis breeds in eastern Siberia and, as the name indicates, Kamtschatcha. In winter it moves southwards along the coast, wintering in Japan, the Korea's and China. It is the largest race, almost as large as Herring Gull. The description below largely follows from P.J. Grant: "Gulls, a guide to identification". Mew Gull kamtschatschensis adult, March 01 2013,Shinobazuike-pond Ueno park, Tokyo, Japan (Osao & Michiaki Ujihara). Adult kamtschatschensis has very variable eye color from dark brown to pale yellow. Mew Gull has a partial moult in spring. It starts in February and is completed by April, leaving birds in so-called "adult summer" plumage. The head turns white, with a red orbital ring. The bill turns all yellow or yellowish-green. In summer, head, neck, tail and under-parts are completely white. The upper-parts are medium grey. The outer primaries are black with large white tips. The inner primaries and secondaries are pale grey with a white tip, creating a white trailing edge. The white crescents on the tertials are very broad. Adult brachyrhychus normally have a black sub-terminal band on P5-P10. Between this black band and the grey centre, a large white spot is visible both from above and below on P5-P7, creating a string of pearls on these primaries. P9 and P10 show large white mirrors. wing kamtschatschensis: 365-412 (BWP III). MEASUREMENTS Lengths in mm; weights in g. Own data based on skins in AMNH, MCZ, MVZ, NHM, NRK, UZM, ZMA, ZMO. L. c. canus Denmark (breeders and wintering birds), Great Britain. L. c. heinei Dvine and Yenisei Rivers, W Europe, Middle East, Iran, Iraq, Lake Baikal. L. c. kamtschatchensis E Siberia, Kamchatka, China, Japan. Note Barth (1968a) gives for Norwegian adult male 330-392 (mean 365, n= 75), adult female 325-360 (mean 345, n= 74). British breeding adult male 328-362 (mean 347.8, n=10), adult female 327-356 (mean 335. 7, n=11). Danish breeding adults: male 346-380 (mean 362.1, n=57), female 322-376 (mean 348.1, n=34). Mean in Danish winter adult male 368.1, adult winter female 348.7, indicating wintering birds from farther N and E. Average for breeding males from Iceland and Faeroe Islands 348.0, for first-winters similar to Danish wintering birds (350.4) (skins in UZM). Note Glutz von Blotzheim & Bauer (1982) give for adult male 362-410 (mean 386.4, n=50), adult female 348-395 (mean 371.8, n=54). Il'icev & Zubakin (1990) glve for adult male 355-402 (mean 381, n=46), adult female 350-400 (mean 371.0, n=36). 34.9, female 32.3. Iceland and Faeroes adult male 33.6. Note Glutz von Blotzheim & Bauer (1982) give mean for adult male 41.8, adult female 39.4. Il'icev & Zubakin (1990) give for adult male 32-43 (mean 38.4, n=46), adult female 31-40 (mean 34.8, n=36). Note Barth (1968a) gives for Norwegian adult male mean 52.1 (n=75), adult female mean 48.6 (n=73). Average for Danish breeding males 50.0, for wintering males 51.2; adult breeding females 45.9, adult wintering females 47.3, indicating wintering birds from farther north and east of breeding range. Average for adult males from Iceland and Faeroe Islands 46. 7 (n=4, skins in UZM). Note Glutz von Blotzheim & Bauer (1982) give mean for adult male 60.2, adult female 57.0. Il'icev & Zubakin (1990) give for adult male 49-63 (mean 55. 9, n=46), adult female 49-61 (mean 53.5, n=36). Weight L. brachyrhynchus Adult: male 376-493, female 326-394. Four first to second-winter males 323-490; first-winter female 292, second-winter female 330 (skins in MCZ, MVC). L. c. canus adult: male 325-552, female 290-530, generally heaviest in N part of breeding range (Barth 1968a, Cramp & Simmons 1983, skins). First- and second-winters 322-540 (Denmark, skins in UZM, ZMO). L. c. heinei mean adult male 547.6, adult female 495.6 (Glutz von Blotzheim & Bauer 1982). First-winter female with low fat-score 375g. Second-winter females 435-458 (skins in UZM). L. c. kamtschatschensis first-winter 583 (skin in MCZ). L. delawarensis adult 390-670, generally lighter in winter, when down to 331.8 in female. Juv/first-winter 288.6-496 (Glutz von Blotzheim & Bauer 1982, skins in ZMA). Mew Gull brachyrhynchus 1st cycle (2CY), March 23 2007, Santa Cruz, CA, USA. Picture: Jeff Poklen. Mew Gull brachyrhynchus 1st cycle (2CY), March 14 2004, Monterey Bay, CA, USA. Picture: Jeff Poklen. Mew Gull brachyrhynchus 1st cycle (2CY), March 21 2012, Rio del Mar, CA, USA. Picture: Jeff Poklen. Mew Gull brachyrhynchus 1st cycle (2CY), March 10 2011, Rio del Mar, CA, USA. Picture: Jeff Poklen. Mew Gull brachyrhynchus 1st cycle (2CY), April 17 2010, Virginia Lake, Washoe Co., Nevada. Picture: Fugl. Mew Gull canus E10X 2cy & 3cy, March 19 2011 & March 23 2012, Benthuizerplas - Zoetermeer, The Netherlands. Pictures: Maarten van Kleinwee. Mew Gull canus 1st cycle (2CY), March 12-13 2016, Grou, the Netherlands. Picture: Mars Muusse. Mew Gull canus 2CY, March 11-13 2017, Grou, the Netherlands. Mew Gull canus 2CY, March 11 2017, Grou, the Netherlands. Mew Gull canus 2CY, March 13 2017, Grou, the Netherlands. Mew Gull canus 2CY, March 10 2017, Grou, the Netherlands. Mew Gull canus 1st cycle (2CY), April 30 2011, Sæby, Nordjylland, Denmark. Picture: Hans Hendrik Larsen. Mew Gull canus 2CY, March 19 2018, Drachten, The Netherlands. Mew Gull heinei 1st cycle (2CY), March 30 2016, Tupkaragan, Mangystau, W Kazakhstan. Picture: Aisagali Kadirov. Mew Gull heinei 1st cycle (2CY), April 25 2013, Aidarshi, Pavlodar oblast, E Kazakhstan. Picture: Oleg Lyakhov. Mew Gull kamtschatschensis 1st cycle (2CY), March 03 2016, Nemuro - Hokkaido, Japan. Picture: Dev - gamebirds.me. Mew Gull kamtschatschensis 1st cycle (2CY), April 12 2007, Choshi, Japan. Picture: Seichoudoku. Mew Gull kamtschatschensis 1st cycle (2CY), April 08 2005, Hasaki, Japan. Picture: Akimichi Ariga. Mew Gull kamtschatschensis 1st cycle (2CY), March 22 2008, Choshi, Japan. Picture: Akimichi Ariga. Mew Gull kamtschatschensis 1st cycle (2CY), March 07 2009, Choshi, Japan. Picture: Akimichi Ariga. Mew Gull kamtschatschensis 1st cycle (2CY), March 08 2003, Choshi, Japan. Picture: Akimichi Ariga.